In the occupied Crimea, police is massively detaining activists who went on single pickets, protesting against the arbitrariness of Russian security forces against the Crimean Tatars. The information was provided by the organization "Crimean solidarity" on Facebook. In Feodosia, five people have been already detained. At the moment they are all in the local District police department. In Simferopol police detained activists Ruslan Suleymanov (near the Alem restaurant), Medzhit Abdurakhmanov (near the Tucha car market), and Ruslan Gostev (near the Borodino ring). Also, a protester Memet Lyumanov was taken away from the Heroes of Stalingrad street. Reportedly, the occupants rudely treated Lyumanov puting him into a police car. He was standing with a poster "Muslims of Crimea are your neighbors, not terrorists." Furthermore, two people were detained in the village of Ukmornoye (Simferopol district). Earlier QHA reported that people came out with single pickets throughout the Crimea. 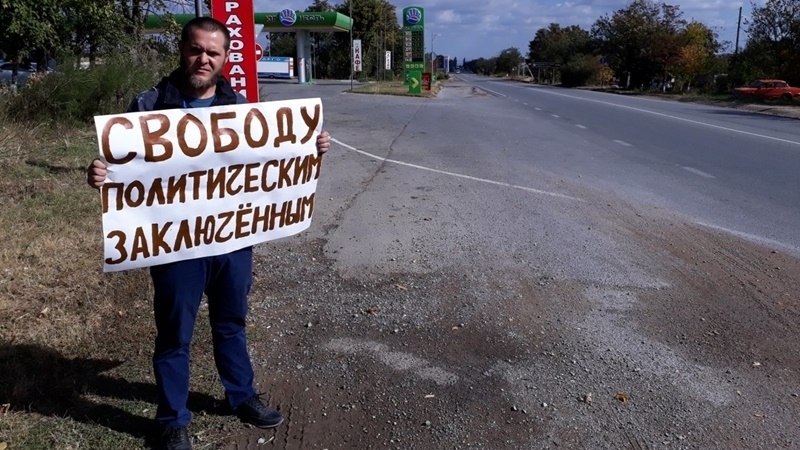 Pickets are held in Simferopol, Dzhankoy, Gvardeysk, Belogorsk and other cities of the occupied peninsula. October 11, occupants were massively conducting searches and detentions in the homes of Crimean Tatars in Bakhchysarai from the early morning. Near the house of Suleiman Asanov, the FSB detained his father, 62-year-old Refat Asanov, brother Elnur Asanov, a relative Ernest Ibrahimov, as well as neighbors Rudem Nedzhiev and Eldar Asanov. The Kremlin-controlled Simferopol court has chosen a measure of restraint for all six Crimean Tatars, who were searched on October 11. The activists were arrested for two months.